Introduced in 2012, Prada Luna Rossa is an inspired fragrance for men who have a passion for success and innovation. Designed by Prada, this cologne features intense top notes of lavender and orange, combined with fresh notes of clary sage and spearmint in the heart and a classic base note of ambroxan. Inspired by the America's Cup team from which it draws its name, this scent is a perfect way to bring the outdoors to the office. Only gave 3 stars because it's NOT like what I smelled in the store & it doesn't stay w/you long, even when on you clothes.. Yet it does have a very pleasant fragrance!! I buy it, then again and again and again! Love, girls love it! I always get complimented when I wear it! And it does last a long time. Maybe some people have more oil in their skin and that’s why it goes away. Stays with me all day at the office. And then at the bowling alley. Highly recommend spraying on clothes versus on the body. I smelled this in the store while on an anniversary trip in Chicago. I instantly fell in love! I have a scent allergy & most colognes & perfumes I can't tolerate, but this one is the bees knees. My husband hods scent very well & when he put this on I melted. The scent is very masculine, but not overpowering. It lingers, but doesn't accost you when wafting. He doesn't have to use much (a couple spritzes on the neck & chest) & the bottle lasted a good year (used almost daily; we got the large bottle). I would highly recommend & I'm here to purchase more! 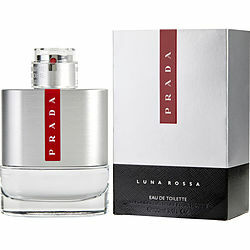 Prada Luna Rossa gets the most reactions by far of any cologne that I’ve ever tried. Women go absolutely crazy over it.